If you really want to prove yourself as a climber and/or certifiable crazy person, forget Mount Everest. Sure, it’s the highest mountain on earth and a tough climb that has taken the lives of many who attempt it, but you can hire sherpas to help carry your gear, and plenty of people have successfully made it to the top since Tenzing Norgay and Edmund Hillary first accomplished the feat in 1953. No, if you want a real challenge, try Meru Peak in India. Noted for its distinctive “shark fin”, Meru may not be as tall as Everest, but it is a notoriously difficult mountain to summit. 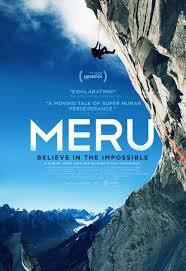 As the documentary MERU begins in 2009, no one has yet reached the top. Led by world renowned climber Conrad Anker, the ascent was filmed by Jimmy Chin (Anker’s climbing partner of many years) and Renan Ozturk, a skilled but comparatively green climber. They almost make it, but various hardships force the team to return without reaching the peak. In the following years, both Chin and Ozturk nearly die while on other mountaineering adventures. Meanwhile, Anker tries to find a balance between his dangerous passion for climbing and his domestic responsibilities as a husband and father. None of these guys should be attempting a climb like Meru again, and yet that’s exactly what they do in 2011, Chin and Ozturk’s cameras once again capturing the ascent. And even if you know the outcome of this second attempt, there’s no shortage of drama and suspense along the way. Aside from the climbing footage itself, which is the breathtaking and the film’s main selling point, there’s ample time spent interviewing the climbers, their family members, and associates. This gives us some idea of what drives these individuals, but unless you’re similarly driven to some dangerous pursuit it’s hard to fully understand why someone would put their life at risk just to climb a mountain. But they do, and for those of us who never would, it’s more than thrilling enough to watch from the safety of a movie theater. 3 ½ out of 4 stars.